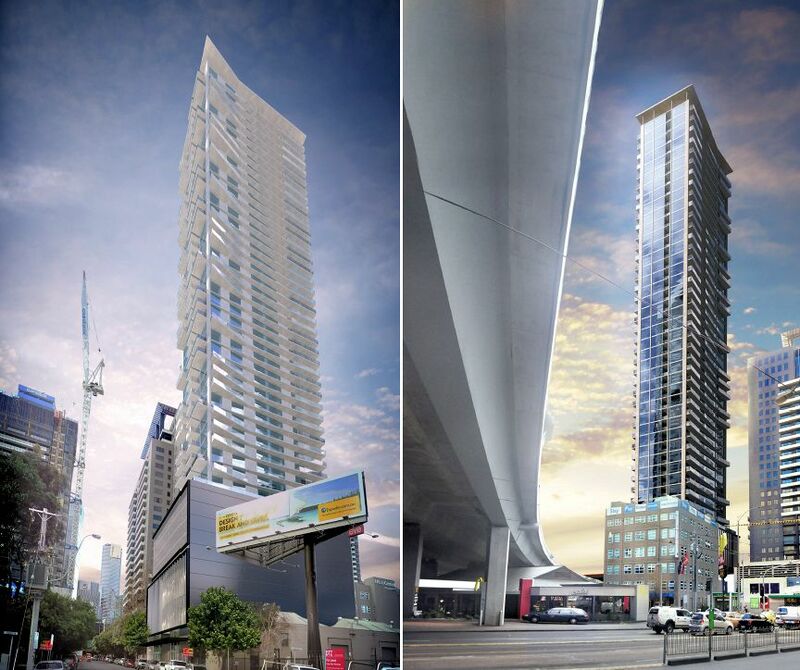 Proponents of a Haig Street, Southbank development site which holds approval for a residential tower have gone back to planning in order to gain an additional eight floors of residential living for the project. Unlike the recent trend of upsizing residential towers for the sake of adding additional apartments/yield to a project, 57 Haig Street will decrease in overall apartment numbers albeit by one. Developer Meydan Group now controls the 1,093sqm site and according to the revised Urbis planning report have sought to reconfigure the tower in order "To achieve their vision for the site." One might assume the experienced developer has considered a redesign an optimal outcome in order to increase the sellability of apartments within 57 Haig Street. Urban planning firm Urbis asserts via the project town planning submission that the revised proposal meets the policy objectives of the Melbourne Planning Scheme while also contributing positively to the evolving built form character of the area. Key to the redesigned tower is an increase in internal apartment amenity and enhanced communal areas plus the incorporation of a north-south pedestrian link between Haig Street and Blakeney Place. The podium will rise to 30.95 metres as the previous basement parking levels has been deleted in favour of additional above ground facilities while setbacks of 10 metres to the existing Clarendon Towers complex, 8 metres to the proposed 334-344 City Road and 5 metres to the south-western property boundary are incorporated. The building is broken into two opposing architectural expressions, the Podium & Tower forms. The Podium seeks to create a heavier grounded base to the building, while the Tower is of a lighter expression with greater level of visual interest, due to the understanding that the Podium will typically be viewed from a closer vantage point and finer detail such as glass treatments, wall joints etc will be easily read and create the interest in the facade. While the Tower will typically be viewed from a greater distance where the overall pattern of the facade treatment will make up the architectural expression. The overall building language is then tied together through the regular height within the horizontal pattern created by the various treatments up the extent of the building both in the Podium and the pattern to the Tower. City of Melbourne's report on the initial proposal states a preferred height limit of 100 metres exists for the immediate area, but can be set aside under certain urban design parameters including providing an appropriate height transition to development in adjoining areas to the south, west and east. 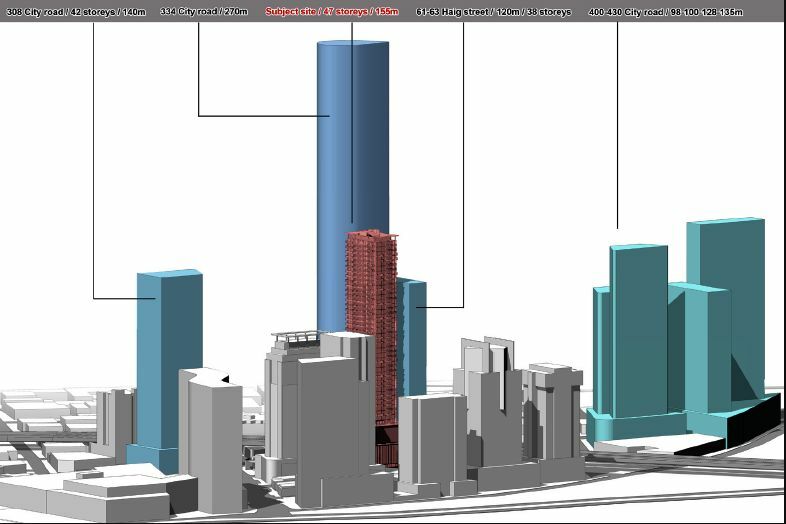 When placed into the current context, 57 Haig Street looks somewhat insignificant next to the hulking 334-344 City Road at 270 metres in height. Theoretically remove 334-344 City Road (which has yet to reach a planning decision) and the height of approved neighbouring schemes ranging from 308 City Road to 400-430 City Road would be quite similar. The image above adequately demonstrates the progression of height and density in recent years where the existing grey structures of between 70-100 metres represents the initial residential forays into this pocket of Southbank. 57 Haig Street seeks to insert itself in a new band of towers around the 140 metre mark while 334-344 City Road would further yet redefine the landscape.